We just got these darling photos of a mother-daughter tea party photo shoot by Christina Milke Photography. Christina chose our pink accent chair and 2 wood crates to create a low-table in the meadow, perfect for afternoon tea. We had a blast shooting one of our bars with the darling Christina Giardinia. She is a photographer who is located in the Tahoe area and was kind enough to meet us in our backyard in Truckee for a mini photo shoot! Our 6 foot bar has so many potential uses and that is why we love it so! 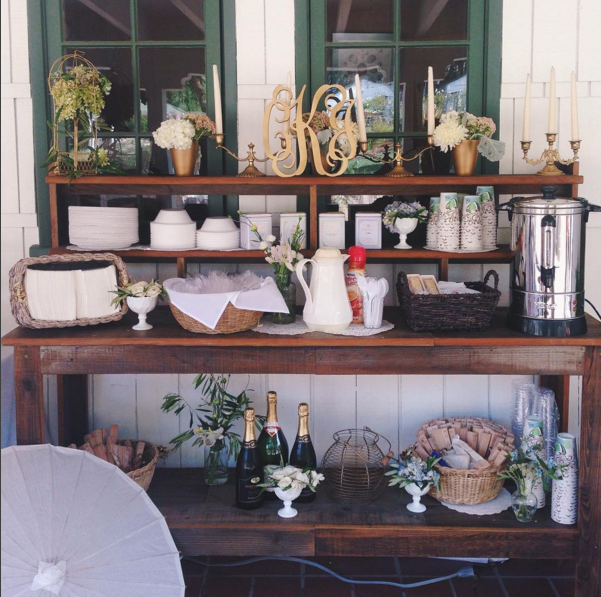 Today we dressed it up as a mini bar of sorts. It also looks great behind our large reclaimed wood bar as a barback and storage piece. We had also rented it as a breakfast buffet and dessert bar. It is one of our favorites for a reason! For more information shoot us an email! We would love to hear your ideas on how you would use our bar!! What sets apart from other rental companies is the fact that we build almost all of our inventory as Urban Mining Co here in Truckee, California. And we admit it.. there are times that is nearly impossible for us to locate and secure our reclaimed wood at a fair price, and in fair quantities... But for us, that is part of the fun! I am sure vintage lovers can attest that there is something about the hunt! Finally locating that unwanted, once-needed, tired wood and rescuing it from the landfill feels pretty great. And lucky us.. we get to bring it into our workshop and transform that nearly-forgotten wood into something that is beautiful, totally unique and will last another lifetime. Because we recycle thousands of boards a year, we feel good about doing our part to reduce our carbon footprint, clean up our landfills and also reduce consumption of our living trees. When you buy from Urban Mining Co or rent from Tahoe Rustic Rentals, please know that we take pride in creating not only gorgeous but eco-friendly furniture that can be enjoyed for many years.